BlogHome » Blog » If we would allow Cave 3 to speak for itself . . .
Cave 3Q, located in the same cave cluster as 11Q, is of non-Essene, lay character (including a Lamentations megilla). It is likely connected with the Zealots, the self-appointed protectors of the Temple and its treasures, since it contained the Copper Scroll, which enumerates the locations where priestly paraphernalia, Temple treasures, and tithe jars were hidden. Also all manuscripts from cave 3 were written within the confines of the first century C.E., quite distinctive from the scrolls from the other cave clusters (i.e., caves 1Q-2Q; 4Q-10Q) which contain substantial numbers of scrolls from the 1st cent. B.C.E. and even the 2nd cent. B.C.E. Allegro believed that the Copper Scroll was a product of the Zealots in: Allegro, J. M. 1960. The Treasure of the Copper Scroll. Garden City, NY. 2d ed. 1964. He may be right. By far the Copper Scroll is the most important scroll that can help to define the nature of the group that deposited the scrolls in this cave. The Copper Scroll lists the hiding places where various temple vessels and precious metals were hidden from either John of Gischala or the Romans (or both). The Zealots who alone controlled the temple, its vessels and its treasury evidently decided to hide the items rather than allow them to be looted as they retreated from either the Romans or, most immediately, from John of Gischala. Curiously, none of the major gold furnishings or vessels were among the vessels listed in the Copper Scroll. This however makes a certain amount of sense since gold was not useful for forming weaponry for John’s purposes. In favor of John, since only the vessels made from non precious metals were in danger of being melted down by him only these were among the metal items deemed necessary to be hidden from him (along with gold and silver of the temple’s treasury which would have been saved from been pilfered). Other items of the Copper Scroll which were of a priestly nature including vestments and tithe vessels provide another link with its priestly owners and the temple. The combined value of the precious metals were worth, in today’s standards, in excess 3 billion dollars. The could represent the treasury of a small nation like Judea but certainly not the property of any single social or religious group. If the Zealot suggestion is correct, this is likely the only surviving work that Zealot party produced during their short 3 to 4 year history. Of the objects: there were fragments of at least twenty cylindrical/tithe jars (or their lids) in this cave, primarily made of Jerusalem clay (cf. , (more than any other cave, aside from Cave 1Q). One jar was inscribed with the letter “teth” which was a known mark on tithe jars also found at Masada and discribed in the Mishna (see Kelei Dema’: Tithe Jars, Scroll Jars and Cookie Jars). One mid to late first century “Herodian lamp” was found. A javelin or lance head was also found in the debris of the cave. All of these finds could be considered consistent with Allegro’s Zealots. However, in order to further advance this theory, more evidence would have to be culled from the surrounding caves that, at that time still remained unexcavated, including nearby cave 11Q. 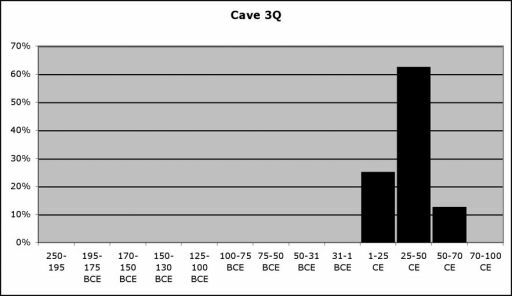 Letting Cave 11Q speak for itself . . .